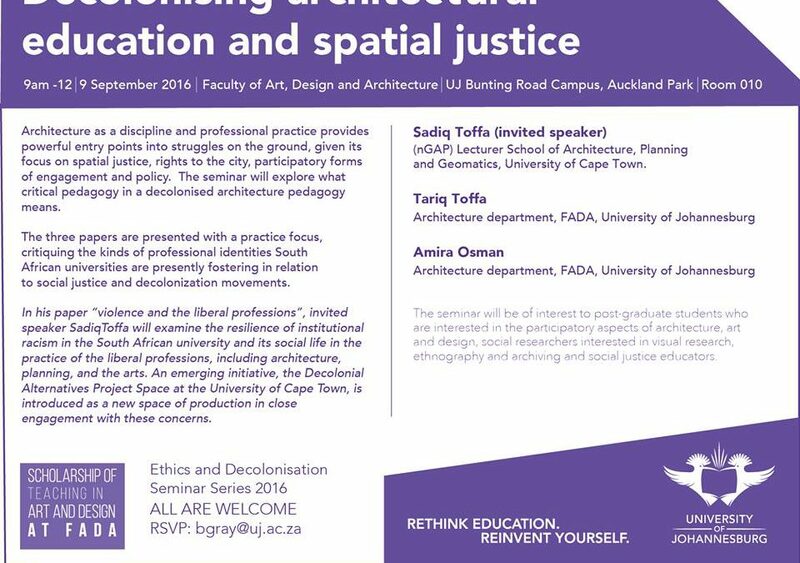 The talk started by a critique of the current condition of architectural education and trying to unpack what a decolonised architecture pedagogy means. This was presented in terms of understanding a university in context, as well as the relationship between the university, the city and decolonisation. The topics of spatial justice, politics of space and ethics in the built environment are described in relation to property rights, access to opportunity and land. The competition for space in cities between big capital and communities. I will refer to the Sudanese situation of state-sanctioned mega development and the Jeppestown experience and how this leads to displacement of people and disruptions of livelihoods. This happens because of competition between “Big capital & communities”, because of state-sanctioned mega development and the resulting displacement of people and disruptions of livelihoods. The relevance of what we teach and how it does NOT support better access to city space, opportunity and small-scale livelihood initiatives. I explain how built form and space can negatively disrupt and how architects, their professional and educational institutes are complicit ito a focus on individuality, image, representation (outdated and irrelevant approaches) rather than a focus on service and skill development and participatory approaches.